Kellbot's Minecraft Server - Kellbot! | Kellbot! We’re building a life-size version of the Philadelphia Museum of Art, northeast of Castle Norton. I’ll post plans here as they’re developed, in the meantime if you want to help we need a huge a whole bunch of sandstone. Each sandstone block requires four sand blocks, so we need a whole bunch of sand. Conveniently there is a NPC downtown who will trade 4 cobblestone for 1 sand. So if you want to help, gather sand and cobblestone. Or just head over to the build site and follow any signs. Build notes can be found here. I’m lost. Where’s my house? Try finding it on the Map Overview, which is a snapshot taken periodically. How do I use the teleporters? The wooden house downtown contains four teleporters, each of which cycles through a handful of destinations. To change the destination, hit the stone button on the side of the teleporter (you may need to double click it). To activate the teleporter, punch the sign and step into the waterfall. How can I add a new teleporter? You can add a one-way teleporter from any location to any of the four “hub” teleporters. An op (i.e. kellbot) will need to link it back the other direction. 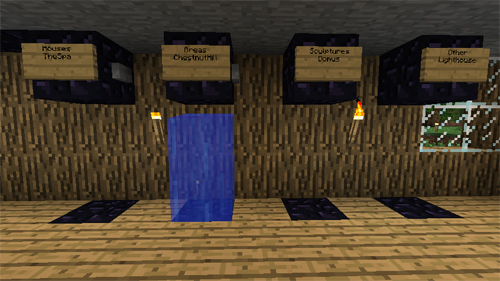 You will need 2 blocks of obsidian and two signs. Place them where you’d like to teleport to/from, arranged as shown in the photo at the left (there’s an obsidian block on the bottom, hidden by the water). Don’t worry about the water. Place the sign on the left last. When you place the left-hand sign, use the first line for a descriptive name (No spaces!). Use the second line to designate which teleporter you’d like to connect to (Areas, Sculptures, Houses, or Other). Click ‘Done’ and you should get a message about the creation of a new gate. You can now punch the sign to travel to the hub. Email Kellbot to set up the return link. 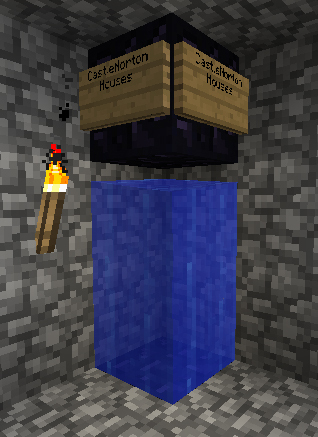 A creeper blew up my teleporter. Now what? Email Kellbot to repair the teleporter. Or maybe have her put it somewhere less likely to get blown up.